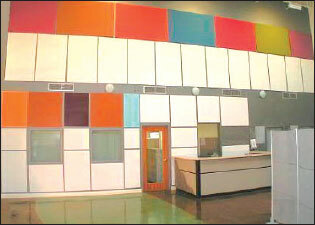 Pre-fabricated panels are panels that are either factory or shop assembled. After meeting our quality assurance criteria, the panels are taken on-site to be installed. Pre-manufactured panels offer an economical solution to your acoustic and aesthetic needs. If your room requires free standing panels, a factory-assembled system may be ideal to suit your acoustical, aesthetic, and budget requirements (e.g. schools, hospitals, municipalities).